After upgrading a Citrix XenApp 5 farm with Hotfix Rollup Pack 6 (HRP6) and Internet Explorer 6 to Internet Explorer 8, the FlexPlan application (which uses Filemaker Pro) was unusable. The application is virtualized using Microsoft App-V, so the system administrators had some difficulties troubleshooting the application. Users launching the application saw the App-V progressbar loading the application. And a few seconds later receiving an message that the application is closed, without seeing any applicaion on the screen. Since the users noticed that IE6 was upgraded tot IE8, they assumed that was the problem. When the Flexplan application was launched by an Administrator, the application does work. So the second though was a permission problem. Begin this year a customer asked me to solve his problems with smartcards (UZI-pas) on Windows CE6-based thin clients. The problem was, in short, that after removing the smartcard it was unrecognized. As a bonus, when a user was authenticated using a certificate on the smartcard, an eject and reinsert was simulated causing the problem to raise instantly. Since the customer has over 2000 thin clients, this is a major issue. During some investigations I found out that the problem did not occur with the Win32 client, only with the CE6 client. So one solution could be to replace all thin client with a Windows Embedded version since this is a Win32 platform. As you can imagine, no customer is happy to hear this as a “solution”. "The desktop you are tying to open is currently unavailable. Contact your administrator to confirm that the correct settings are in place for you client connection." 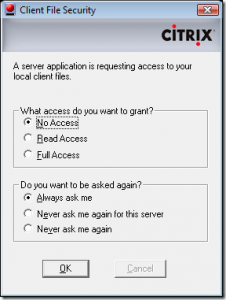 In the Citrix ICA client, or XenApp Client Online plug-in, the access to your client drives is protected.